– chop scallion, mince ginger and combine in a bowl with sesame oil, siracha, honey, ponzu, tamari, lime juice and sea salt. set aside to marinate while you cook your noodles. – adjust to taste- i added a bit more siracha but would also recommend chili oil, or chopped jalapeno peppers for the brave! – garnish with sesame seeds and enjoy! Yum! This looks like such a great spin on a lazy weeknight meal — have you been able to find specialty ingredients like ponzu or tamari at a typical grocery store, Trader Joe's or the like? hi liz! yes, absolutely! in the asian section of any regular grocery store you'll be able to find ponzu and if not tarari then soy sauce for sure! 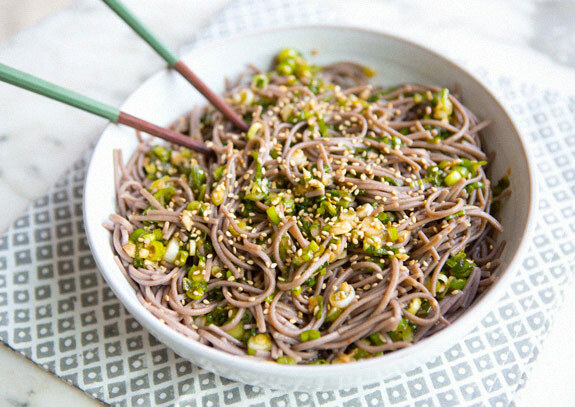 I love all things noodle… the hubby and I must try this! 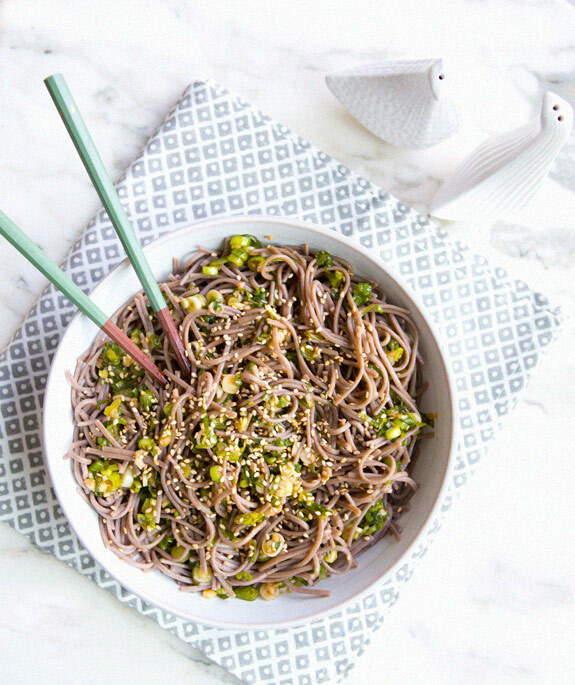 Soba noodles are so delicious, I always keep some in my pantry for a quick weeknight meal like this. They are unusual enough to seem special, but are still comforting and familiar. Great recipe. This looks like a total must try and totally delicious! Hi Sarah! I absolutely love your blog. It makes my day when I see a new one up in my email! I, like you, do not eat meat or dairy, or any animal products, and this looks simply delicious! I also have a favorite go-to sauce I use for my soba noodles– 1Tblsp tamari 1Tblsp peanut butter, 2tsp Sriracha. I use an organic peanut butter with the only ingredient being peanuts. My husband loves this sauce. And you can add almost any vegetable with this dish. so happy you all like this! Hey – It's almost a year later…this looks good and I'm looking forward to trying. One question – does this use Ponzu or Ponzu sauce? I have never used either and only discovered the difference when trying to get some. Ponzu sauce seems to have tamari already included. So I don't know if using Ponzu sauce AND Tamari will be too much Tamari.